We have printable number line worksheets for teaching counting, skip counting, addition, subtraction, and number patterns. Cut out the parts of this number line and glue them together. This number line includes numbers one through ten. This page has two number lines, with the numbers 0 through 20. This cut-and-glue number line begins has a range of zero through one hundred. When you attach all of the parts it's about nine feet long! Cut, glue, and build this giant, 9-foot number line, which includes all integers from negative fifty through positive fifty. Count by ones and write numbers in the empty boxes. Fill in the missing numbers that come before or after the given numbers on the number lines. This worksheet contains only 2-digit numbers. Add the missing 2-digit numbers on the number lines. Write the numbers that are missing from each row. This page includes only 3-digit numbers. Complete the number lines with the missing 3-digit numbers. Write the positive and negative numbers on the number line and answer the questions. Use the number line to learn and practice basic addition skills. Solve the basic addition facts using the number line. Add the positive and negative integers on the number line. Review addition of negative and positive integers. Show jumps on the number line to solve the basic subtraction facts. Count backwards on the number line to solve the basic subtraction facts. Use the number line to solve the problems. Tell how many spaces you had to count back. Another subtraction worksheet that requires students to count backwards. Add or subtract on a number line. Show the jumps. Subtract positive and negative integers by counting backward or forward on the number line. Another worksheet for teaching positive and negative integer subtraction. Use this number line to count by 2s. Complete the activity by filling in the boxes. This number line ranges from 0 to 32. Count by 3s on these number lines. The number line begins at 0 and ends at 33. Skip count by 4s and write the correct numbers in the boxes. 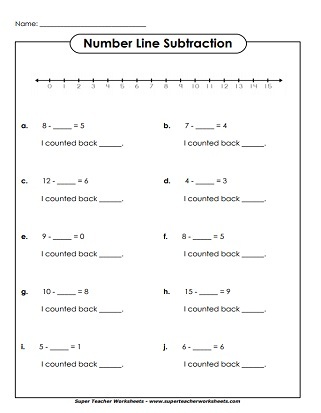 Practice counting by 5s on this printable worksheet. 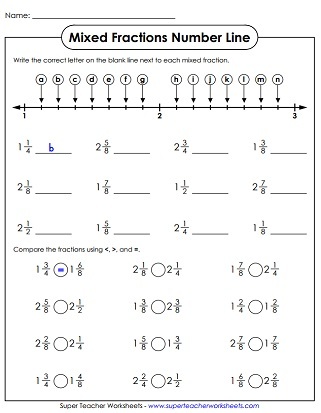 On this page, students will review counting by 10s with a number line. 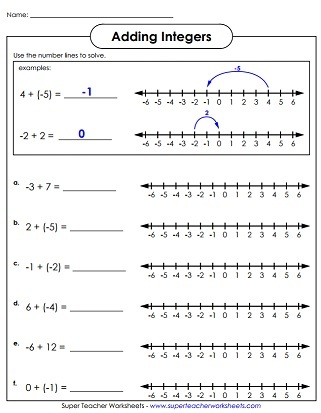 Counting by twenty-fives is easy to understand with these printable number lines. Complete each number pattern on the number lines shown. Write the missing numbers from each set. Then explain the rule that you followed to determine the answer. Each number line contains two variables. Write the correct number for each variable. Tell where each fraction should appear on the number line. Tell what fraction is represented by each letter on the number lines. Label each mixed number on the line. Write the letter from the number line that corresponds with each decimal number. Each decimal (hundredths) corresponds with a letter on the number line. Match the letters with the numbers. Tell what decimal is represented by each letter. Decimals are all written to the nearest tenth. Create a double number line to solve each word problem. Super Teacher Worksheets has a huge collection of math worksheets for most skills taught in the elementary grades. Complete the number patterns and write the rule for each. Practice skip counting by 2s, 3s, 4s, 5s, 10s, 25s, and 100s. Hundreds charts can also be used to teach place value, adding, subtracting, skip counting, and number patterns.